I've just been quoted a price of $NZD750 plus tax for a new diff mount P/N 33171130900, from BMW here in NZ!! That is ex-Germany, with a minimum 10-day delivery time. By comparison, the Pelican Parts price is $USD265 ($NZD340) and the UK price is £174.93 inc VAT, or $NZD360 at the current exchange rate. Somehow I think I'll be ordering mine directly from Pelican or the UK, as even with shipping added, it will be less than half the price I've been quoted here. You can see why most people go for the M535i one now. Pelican price seems reasonable though. If you're ordering in less than four weeks, I can get you $USD10 from Pelican (I ordered parts there a month ago and got a coupon for orders over $100) PM me if you're interested. Thanks - PM sent, but you probably won't be able to reply as you have less than 75 posts. I'll pm you with my email address if I decide to go ahead. Last edited by BMWWGN; 21st November 2010 at 12:07 AM. 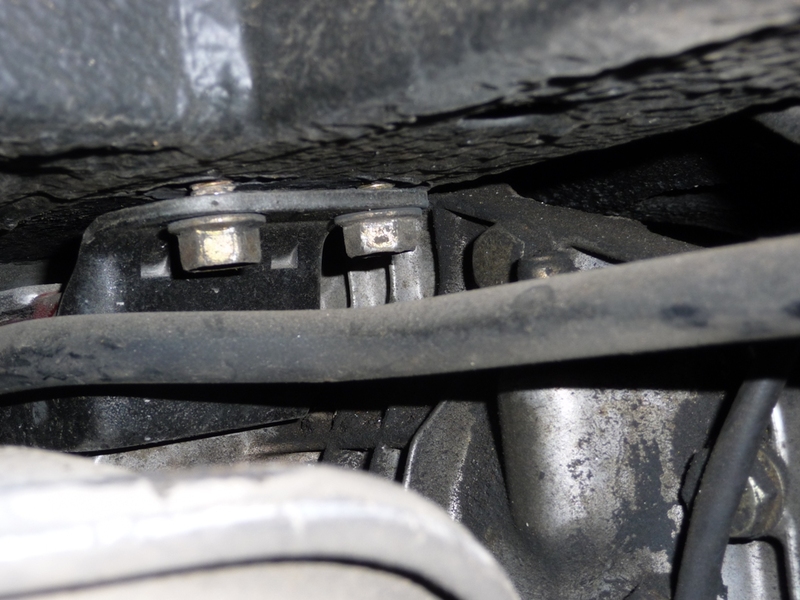 While working under my car recently, I discovered all four mounting bolts for the centre diff mount were loose, with two of them backed off by several threads (see picture). I've re-torqued all of the bolts for the time being, but I'm now even less comfortable with this urethane mount installation, so I've decided that once the bank balance has recovered from the holiday season expenditure, I'll go ahead and order an OEM mount from Pelican. They've sent me a $20 discount voucher following some recent purchases, so thanks again to e28-4ever for the previous kind offer, but I'll be able to use this new voucher if I order within the next four weeks. Where the rear axle mounts to the body the metal is triple skinned. The two inner skins are welded from the factory to the sleeve that the bolts go through. The third one is not (Outer skin). Over time water gets in & it rusts away. The axle mount then collapses in & then rests on the inner skins hence why one side is higher than the other. This also pulls everything out of alignment causing exaggerated wear. Just changing the bushes will not help. New metal will have to welded in. The new plate should also be welded round the sleeve. This makes it much stronger & stops water from getting in between the skins. Refer to my post for details & pictures of repair. I wonder BMWWGN if the urethane was responsible for those bolts. Doesn't seem likely those bolts coming loose (of course, a NON-PERMANENT thread locking compound may help). Not unsurprisingly, my diff mount bolts stayed put, which in turn tore the center out. In the course of my ownership experience I've learned to do complete rebuilds of components (one bad part kills at least two others, don't you find?) and this rear end will probably prove to be the biggest pain in MY rear . So which OEM diff bushing are you going with at Pelican? I would like to find the beefiest all rubber bushing available (I think is for the M5? ), and I tend to agree with you over using urethane in these bushings. Keep us posted and have a happy new year! Resurrecting this thread. My father and I recently acquired another DC93 E28 M5, 2875122 and recently put it up on the lift to examine and create the tome that will be the parts list. I noticed the poor condition of the differential mount and it ran through my head there was something very unusual about that part. I couldnt place it, so I checked on RealOEM, the price $256USD. Sounds a bit high for what it is, but not out of order for 31 year old M car. Then I put into the search engine and clicked on Turner Motorsport . . . $450 LMAOOOOOOO. Clicked on Bav Auto, $480! That was the issue, this part is priced far above the seemingly equivalent non-M E28/E24 parts. I even checked rockauto to see if they had anything from their array of suppliers, nothing. Im not going to spend $450 on this, Im not EAG with the OCD mindset. So options, get the M535i part as mentioned by davidoli. Easy. Get the E34 M5 part, which is pn 33311132251 and see if this is another possibility. $136 and also fits the E32 750i so perhaps this is an upgraded part that can handle the load paths better. I put my name down for the "bombproof" diff mount on bimmerforums. Interesting design, surely will increase wear to some degree but I think it might be worth investigating. Hopefully enough people are interested to get another run. Probably $250-300. So Ill spend more than the $450 in the end, but thats sort of how this goes. How about a cheaper solution. The e34 mount is a redesign of the e 28 mount. €40 the same part as fitted to the e34 M5. This part has two metal plates and smaller rubbers on each side of the mounting hole. The standard e28 has one metal plate each side of the mounting hole and larger rubber sections. The e28 M5 should have the two metal plates either side. This is the "uprated M part" with the huge M Tax. The e34 part mounting point is approximately 3-4mm shorter than the standard e28 part. A shim of that thickness will raise the mounting point or you can grind off part of the metal of the e34 mount so that the differential mounting arm clears the metal on the mount. The reason in that the e34 mount the metal frame is level with the rubber mount and in the e28 the side facing the differential is lower by 3-4mm (this is so the differential mounting arm does not contact the metal frame of the mount) The e34 has more metal there than the e28 so no loss of strength. That is quite a saving on the M5 part. Thank you for the information. It looks like the part you mention was superseded in real oem, hence I went with the most current part in real oem. Pelican Parts has the one you suggest for $52USD, substantially cheaper than the one I found. Ill probably buy one of each and see what is the difference, both mounts are listed for every E34 model from the 518 to 540 and M5s, so the mount can surely handle what the stock S38B35 can throw at it.